I’m pleased to say that, at last, my breathing problems are beginning to ease. Things had not been improving much since our last walk, following which tests revealed that it was all down to a bacterial infection, and not a viral one as was initially thought, so antibiotics could now be prescribed. These are starting to take effect and I’m gradually getting back on an even keel once again. 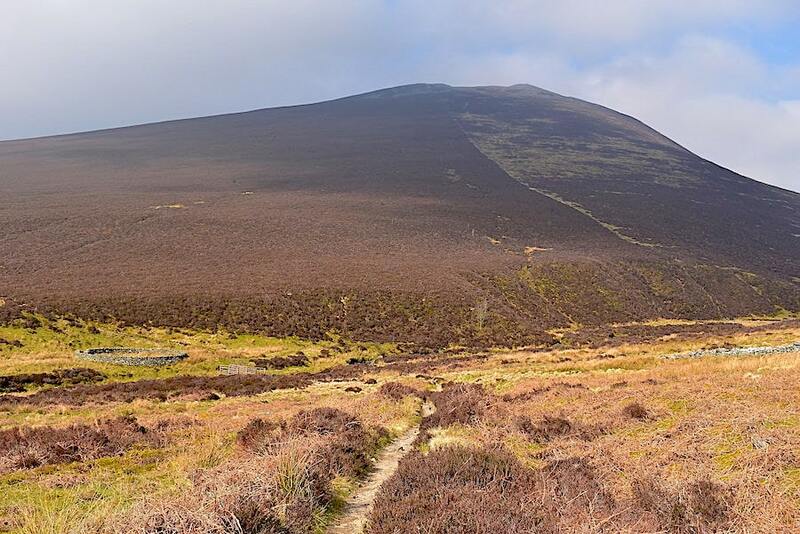 Today’s walk includes a very steep climb up Great Calva and later on, another one up to the summit of Knott. Not fells I would have considered walking just recently, but I thought I might be able to manage it even if I had to take a few more pit stops than usual along the way. 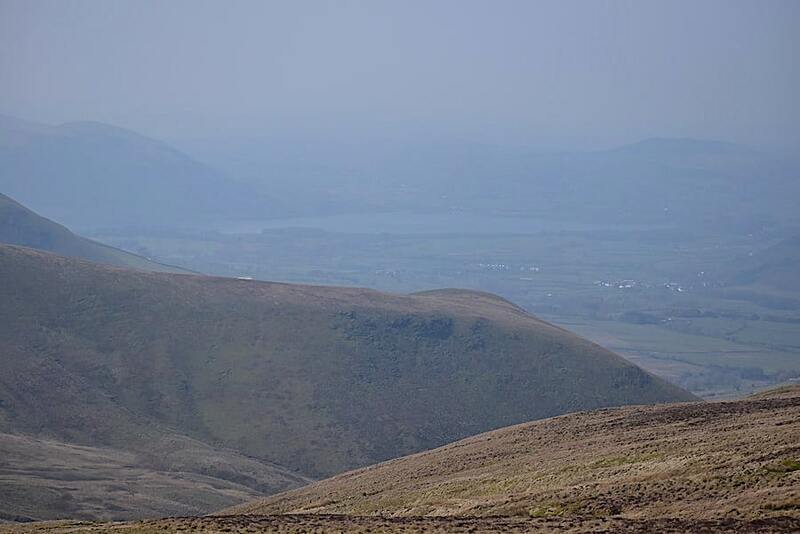 There was a very thick haze everywhere today so it wasn’t a good day for long distance views but in general we had good weather for our walk over these two fells. 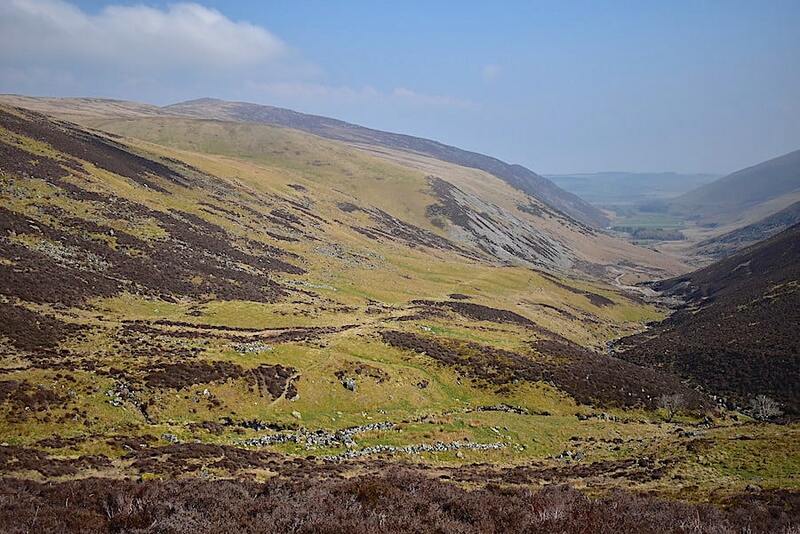 We have walked them in the past but Great Calva has always been included in walks over the ‘Back o’Skiddaw’ fells, with Knott generally being included in walks over the Uldale Fells. Today we thought we’d do things a little differently by including both of them in one walk and viewing them from unfamiliar perspectives. 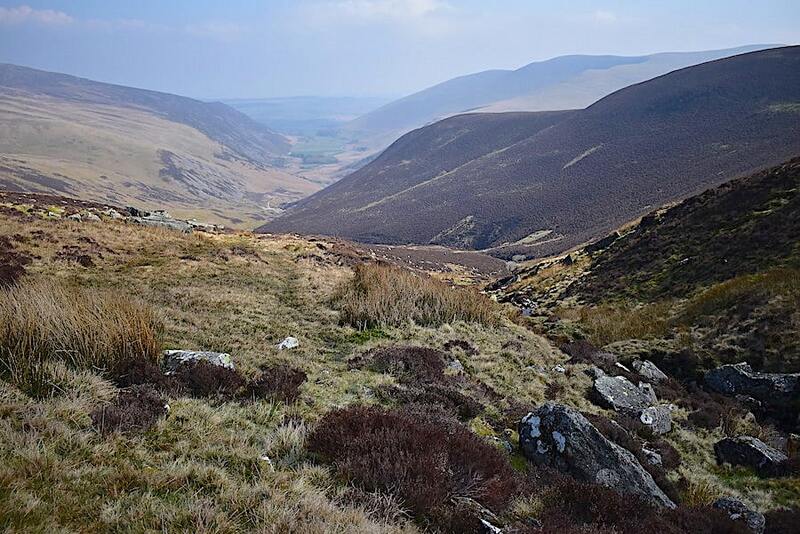 Looking along the Caldew valley from the Cumbria Way path. There is a small and rough parking area over to the left of the shot with a couple of cars already parked when we arrived. A family of four crowded around the boot of one of them getting themselves kitted up in readiness for their walk. It took a while but eventually they headed off up Grainsgill Beck so we supposed they were heading for Knott and that they might well be taking the same route as ourselves but in reverse. If so we knew we would meet up with them again at some point along the route. 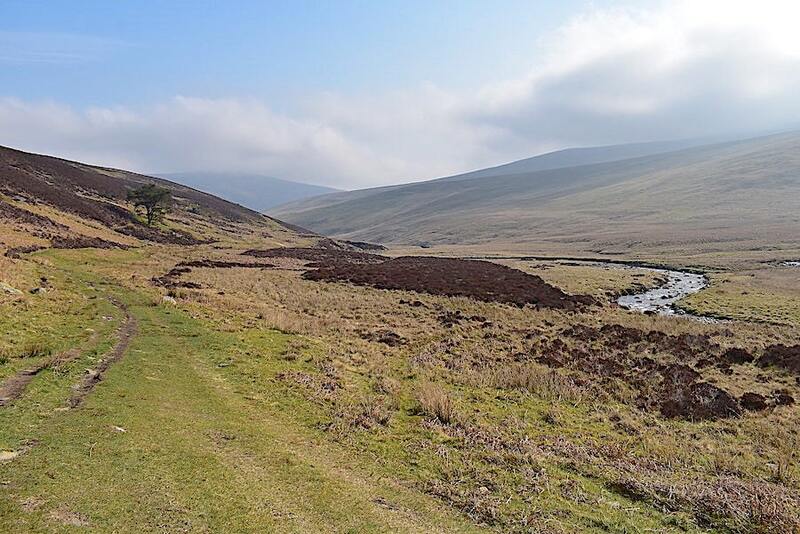 We set off in another direction, along the Cumbria Way, heading for Wiley Gill. 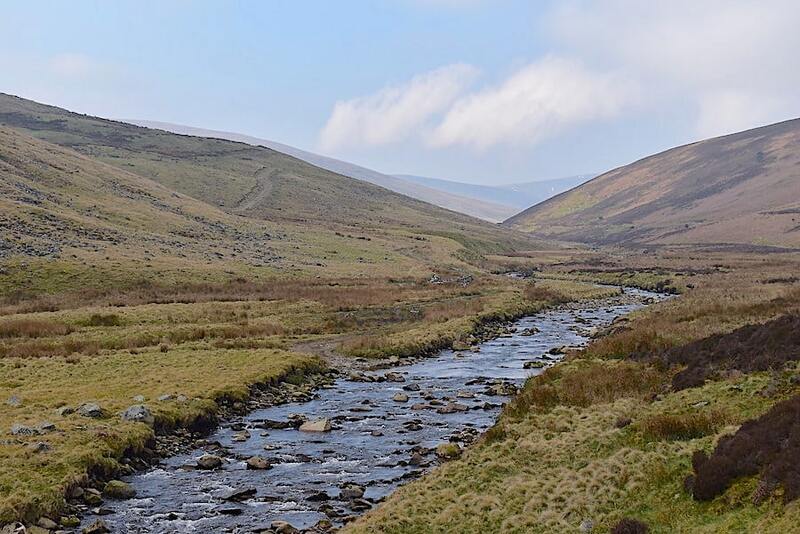 The River Caldew accompanies the Cumbria Way path all the way along so its a very pleasant route to walk. Other than our occasional conversations the only sound came from the river as it splashed and gurgled its way over the rocks and stones. 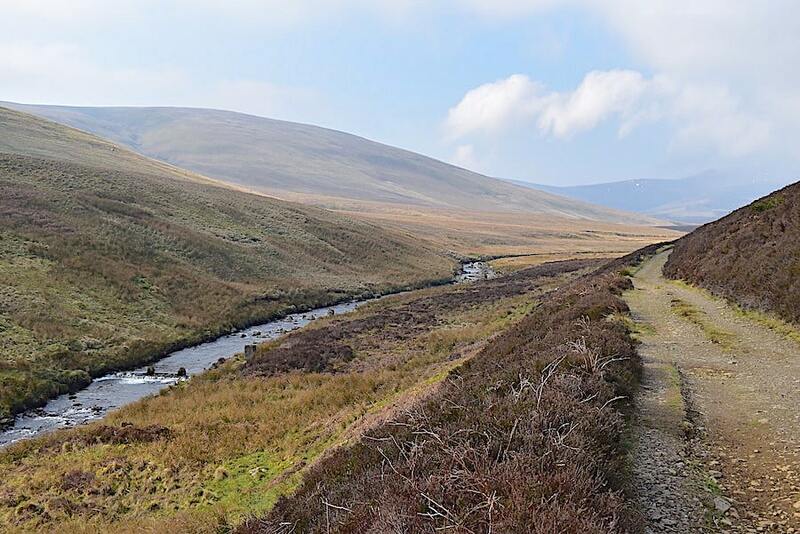 Just ahead is a ford, with the track from it passing alongside the river and then making its way across the fellside. Farm vehicles would have no trouble crossing the ford but it might have been an over the boot tops affair for anyone on foot today. 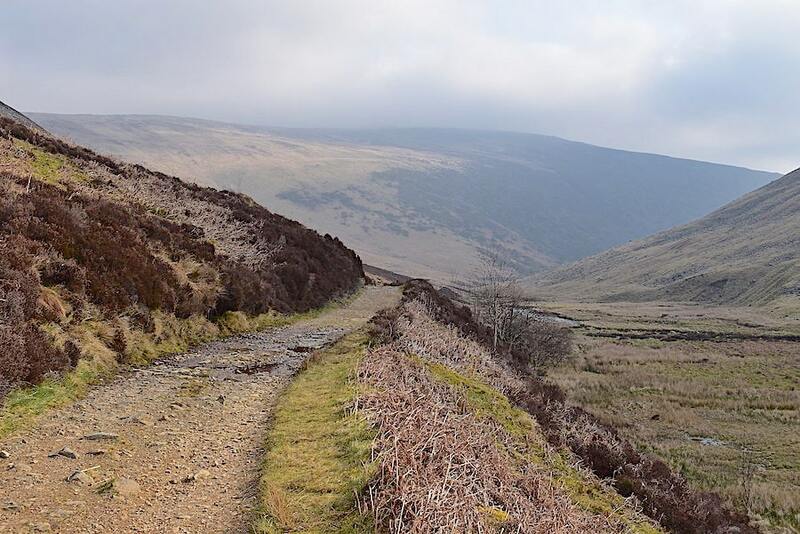 Looking back along the track towards a hazy and clouded Carrock Fell. We’ve gained some height at this point and the path is now much drier than it was a little lower down. Several small becks drain off the slopes back there leaving the path very wet and muddy in places. The height gain is clear from this look back but its quite gradual and you don’t really notice it at all. Just above the point at which the river seems to disappear from view you might be able to pick out a speck of white which is one of the cars in the parking area. The slopes of Coomb Height are now in shot on the left of the path and beyond them Carrock Fell still has a lot of cloud billowing above it. 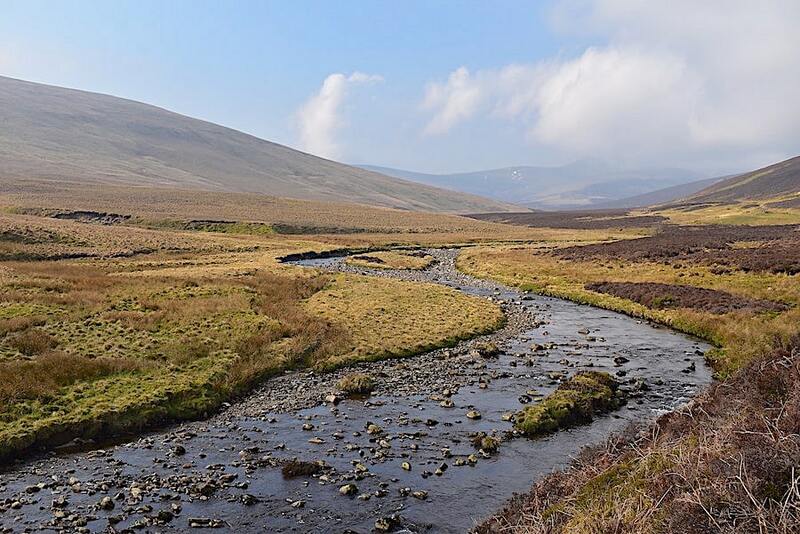 The track and the river running along in tandem as we continue on towards Wiley Gill. 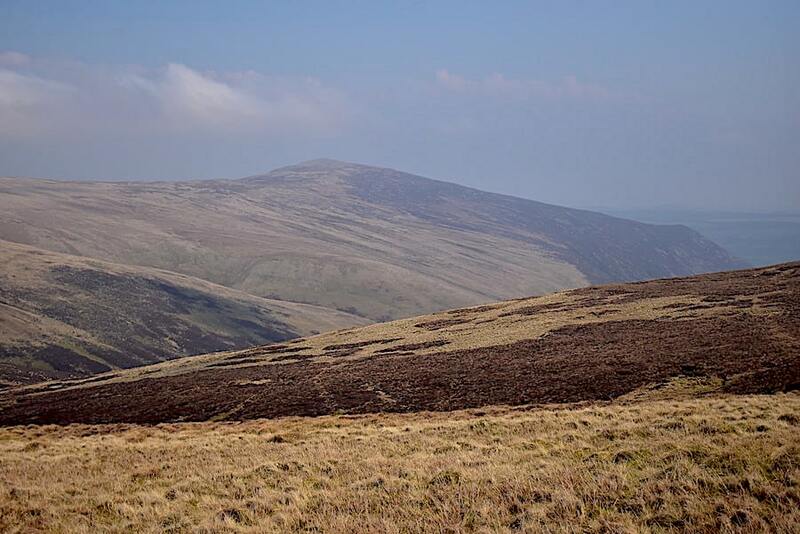 Mungrisedale Common is coming into view on the left skyline. The Caldew curving, snake-like, through the valley bottom. 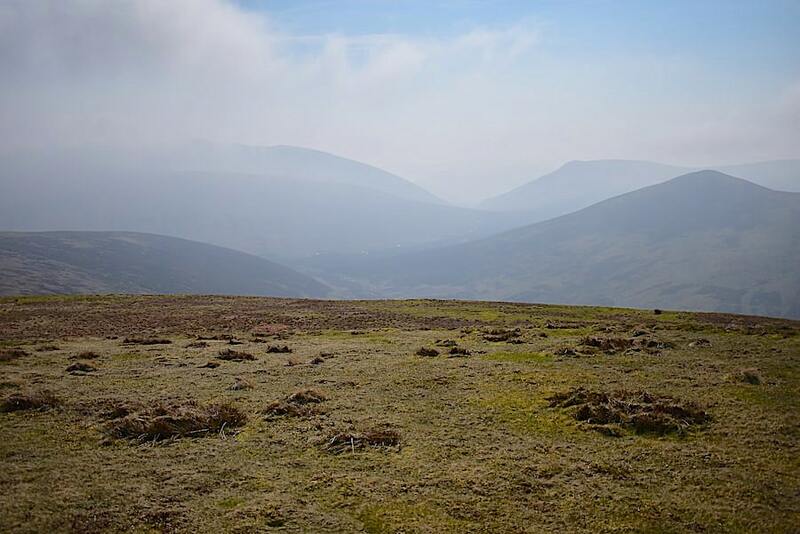 The river rises on the slopes of Skiddaw, which would have been visible in the distance but for the haze and the lumps of cloud which kept drifting around it, so its travelled quite a distance already. Cloud continually drifted around the Skiddaw group so we never really got a good view of it all the time we were out, which was a bit annoying, especially as I had brought along the larger zoom lens for just that purpose. After the previous shot a very moist section of the path had to be negotiated, previous attempts by walkers to avoid it has created a path, a little higher up the slopes, which initially looked much drier so we chose to use it, only to be met with something even soggier so back we went to the lower one and bog-hopped from one slightly drier bit to another. 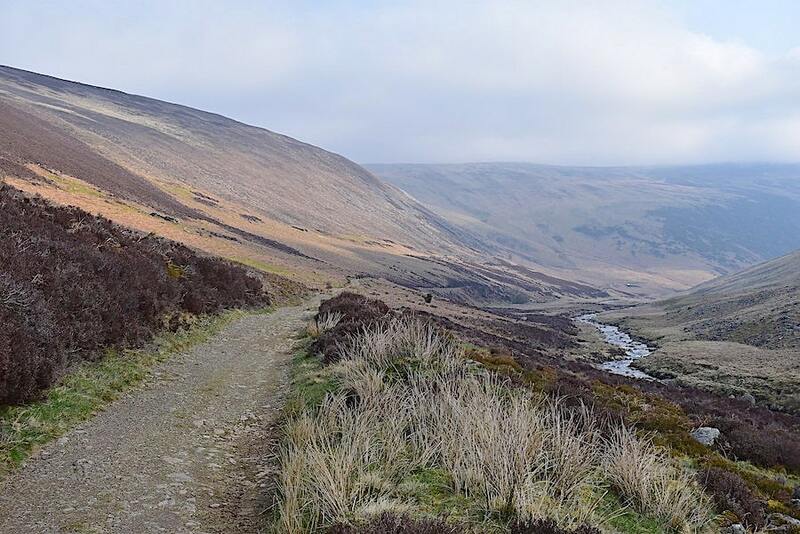 Eventually the path dried out again so being back on terra firma I took a look back along the valley. Carrock Fell is now a long way behind us and over on the right the slopes of Bowscale Fell are beginning to appear beyond Mungrisedale Common. Both tops still beset by cloud. We reach the derelict hut and sheepfold beyond which we had our one and only view of Lonscale Fell and Skiddaw Little Man so I grabbed a shot while the opportunity was there, despite the hazy conditions. Seconds later the cloud swirled down and that was that. 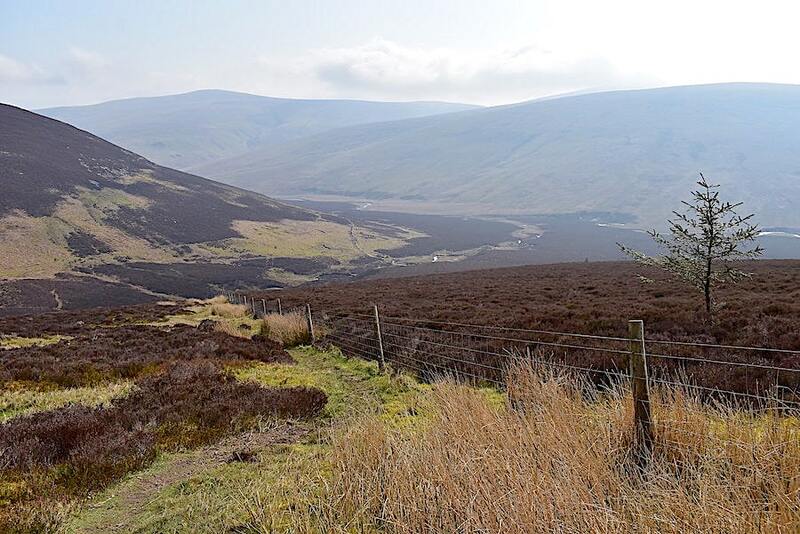 Great Calva eventually comes into full view as we approach Wiley Gill with its footbridge and circular sheepfold. For anyone thinking of using this route it may be helpful to use this shot to show which direction to take once across the footbridge. 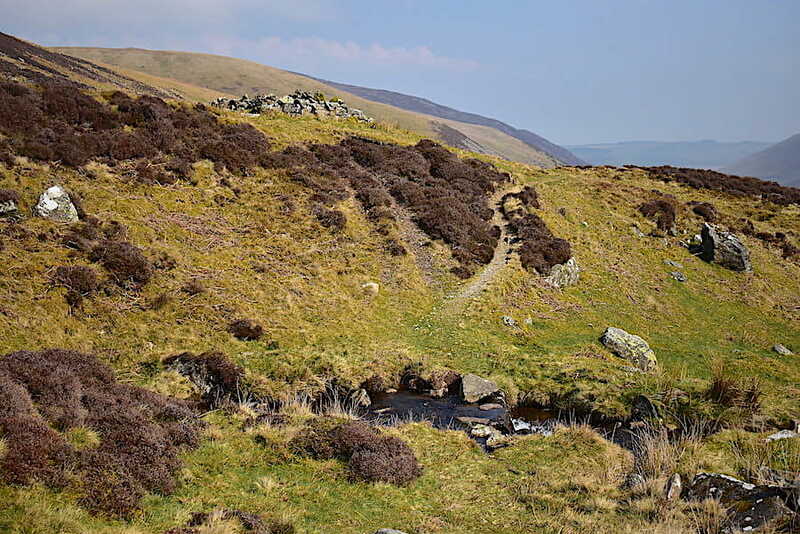 A path, heading to the left, leads from the bridge and continues on as the Cumbria Way. 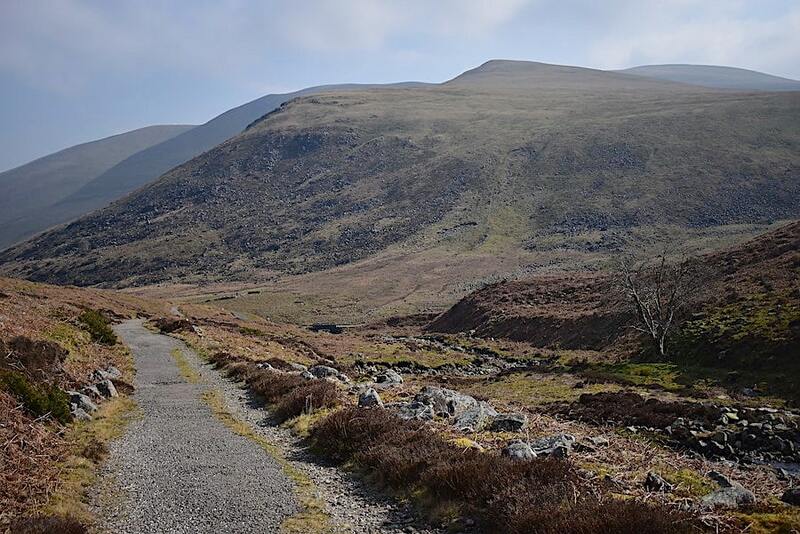 For anyone wanting to climb Great Calva, once across the bridge ignore the left hand path and turn right alongside the beck. Follow the path beside the beck for about a hundred yards at which point it becomes stony and turns up the steep heathery embankment. At the top of the embankment the path then turns right and leads to a handgate in a wire fence. Once through the gate all that’s left to do is follow the fence line up the very steep slope to the summit. Looking towards Knott from the bridge across Wiley Gill. Once across J decides its a good place for a Mars Bar break so we get out the coffee, plonk ourselves on the warm grassy bank and enjoy doing nothing but listening to the sound of the beck and the occasional bird call for a while. 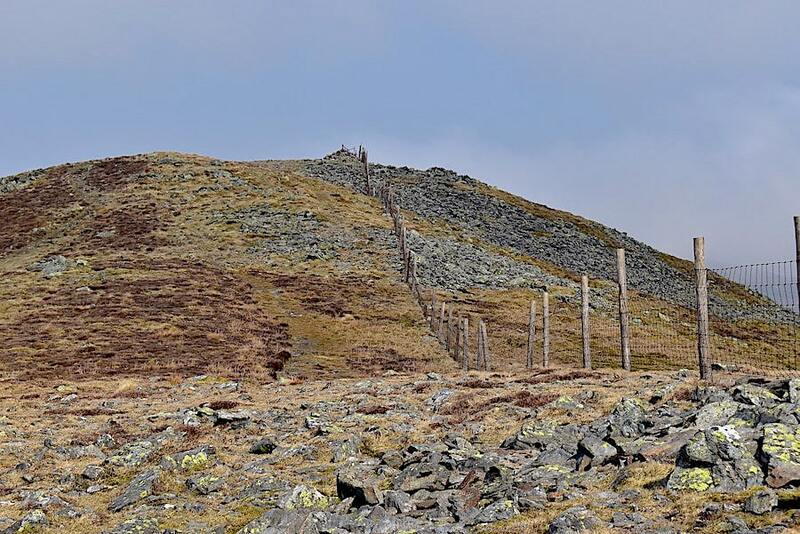 After our break off come our jackets and out come the walking poles in readiness for the steep climb ahead …..
….. the view down to Wiley Gill from the first steep, but very short, climb up the embankment from the path beside the gill …..
….. and then the longer, and much steeper climb up to the top of Great Calva. 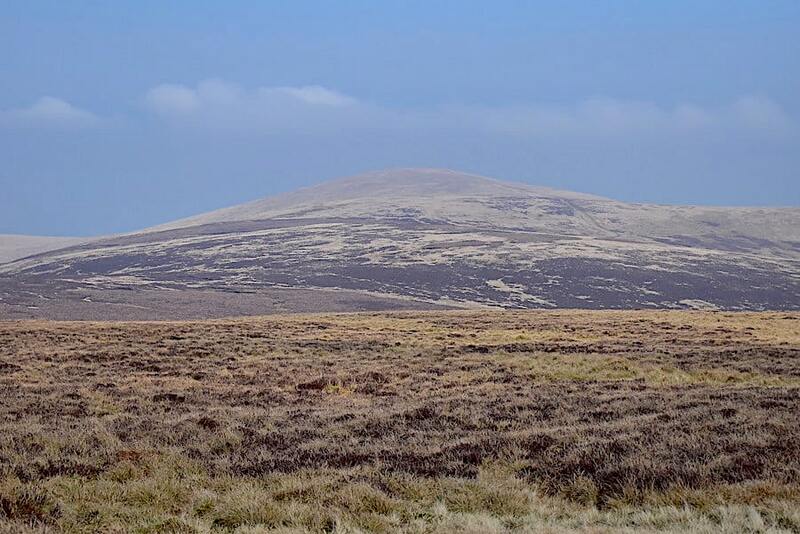 The handgate is just out of shot to the left and the summit of Great Calva is the greyish peak over to the right. 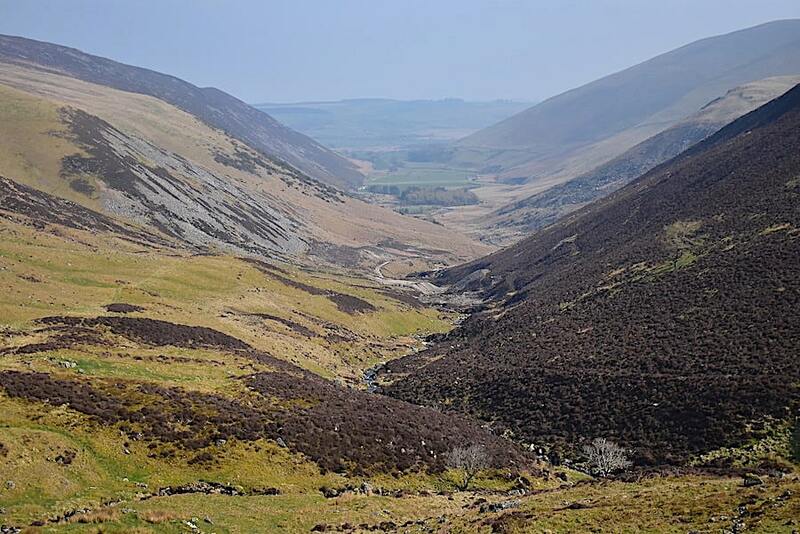 A look back down into the valley as I stop to take off my jumper and get myself down to short sleeves and bare arms. Despite all the bits of cloud drifting around the sunny spells are very warm so I needed to de-layer at this point. My breathing is OK and consequently I’m doing much better than I thought I would. 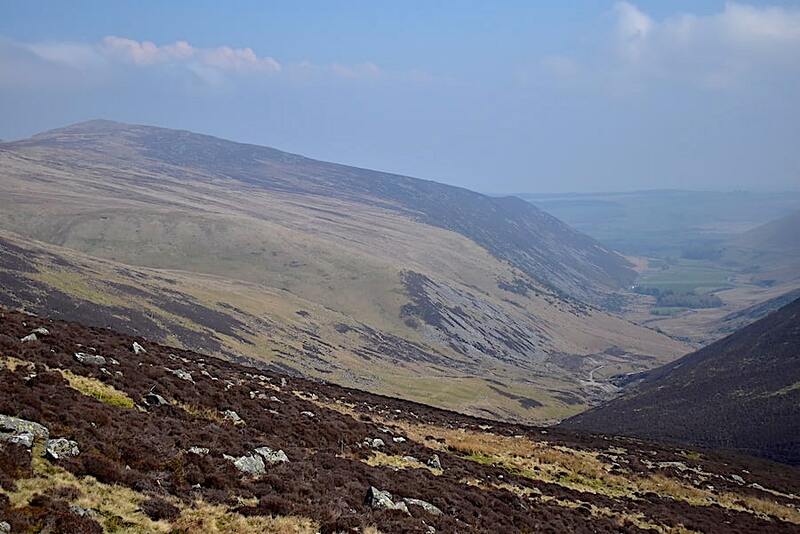 The heathery slopes of Pike, one of Knott’s three ridges which thrust their way down into the Caldew valley, are on the left. 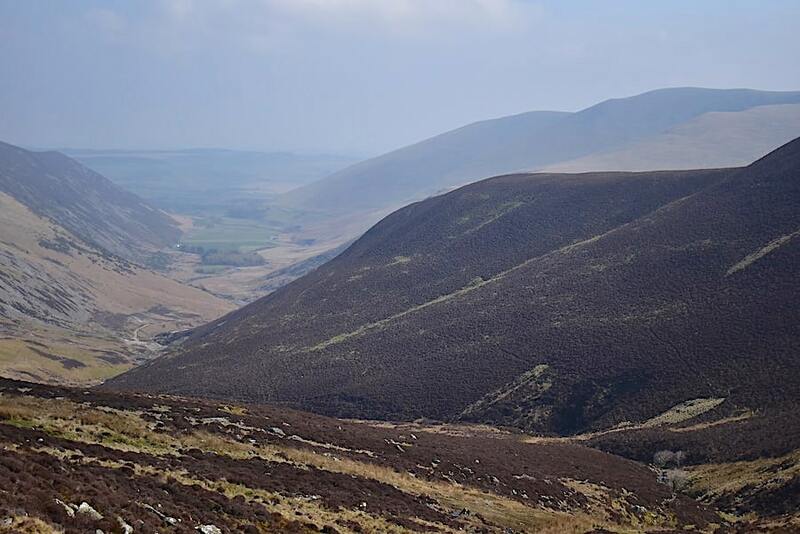 Above that, on the left skyline is Bowscale Fell with the merest hint of Blencathra appearing behind Mungrisedale Common over on the right. Much higher now and taking another pause for a breather I look across the river towards a very murky Mungrisedale Common. Behind it the summit of Blencathra is obscured by cloud and …..
….. over to my right there’s a similarly murky view of Lonscale Fell. If you zoom in and peer hard enough you might be able to pick out Skiddaw House, towards the bottom right, in the gloom. 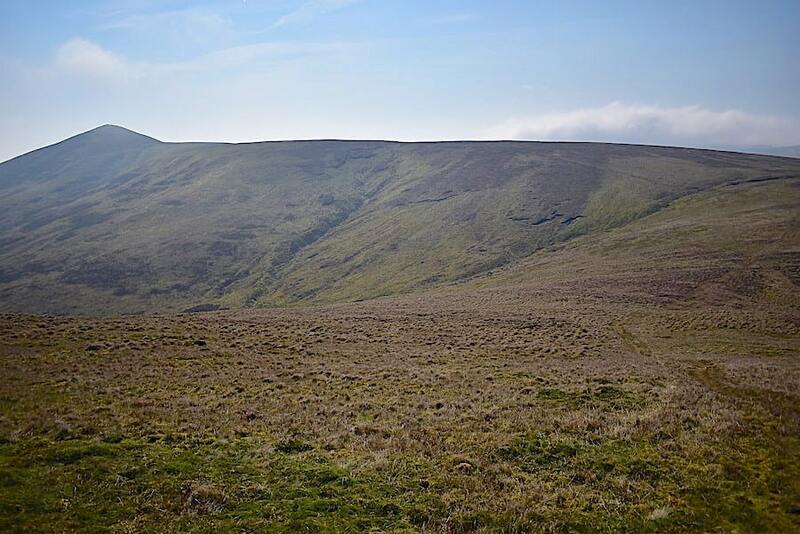 Well, my breathing may be getting better but the lack of any really strenuous walking for the past few weeks is definitely being felt in our legs as we turn up the steep slopes once more. 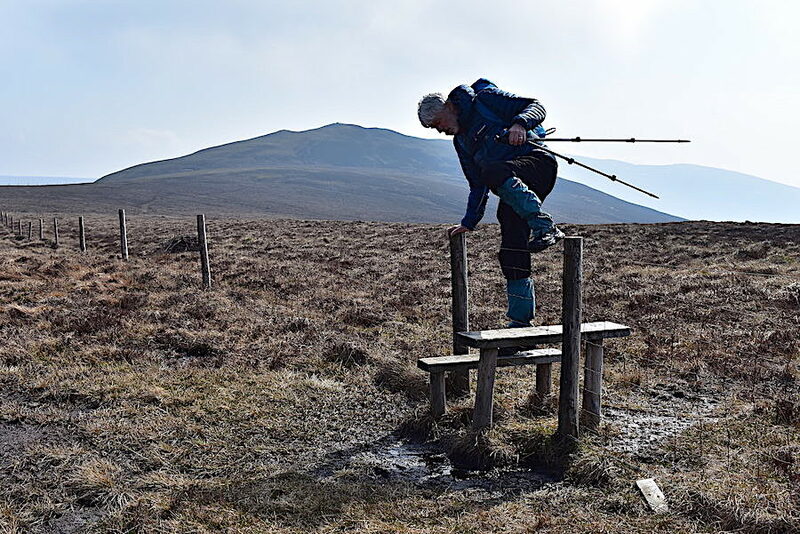 The fence we’ve been following meets another one coming across the top of Great Calva and a small wooden hurdle placed at the fence junction assists in our crossing of the fence. Had I known how strong the wind would be when we reached the ridge line I would have put my jacket back on just before we reached it. 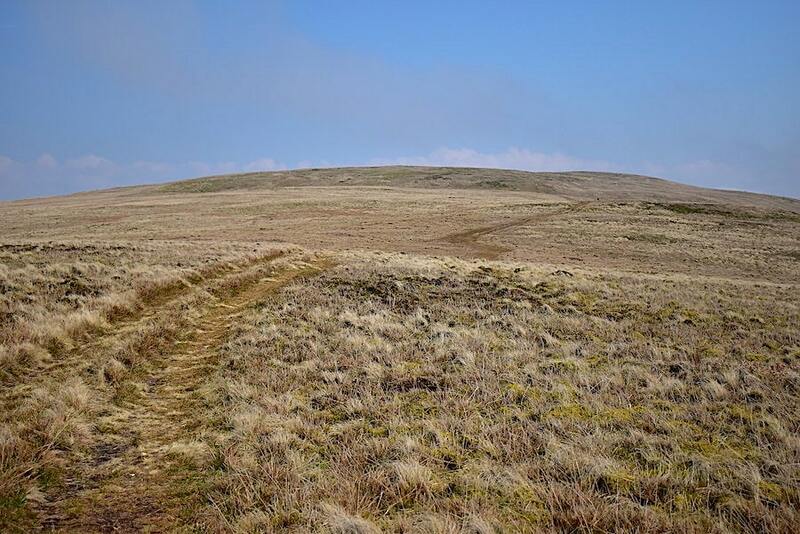 There had been no wind anywhere at all up to this point but as we put our heads above the parapet, so to speak, we were almost blown straight back down the fellside. It was a bit of struggle to even get our jackets out of our packs, never mind put them on, but we eventually managed it and with hoods on and pulled tight we were soon wrapped up snugly once again. I had to brace myself against the fence to take this shot across towards Skiddaw which still had its head in the clouds. The long zoom lens remained unused in the bag, who wants a close up view of murk and clag? 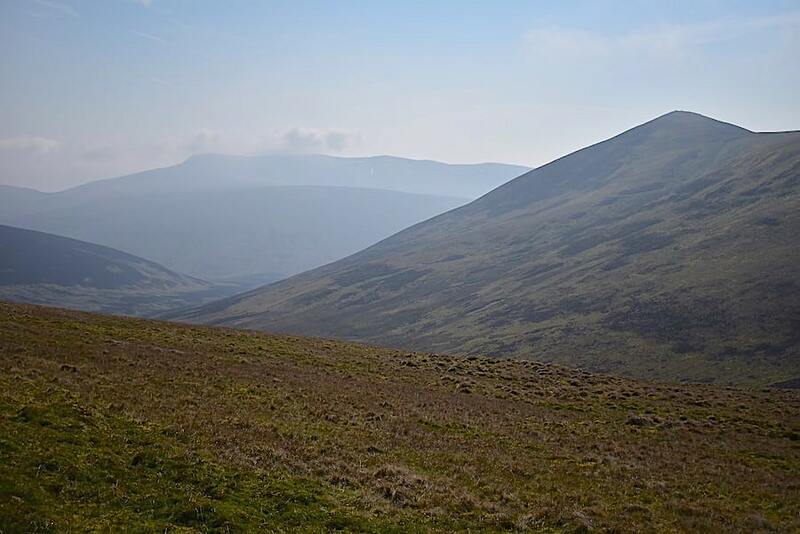 Things are rather better in the direction of Little Calva where only a few small clouds are drifting by. 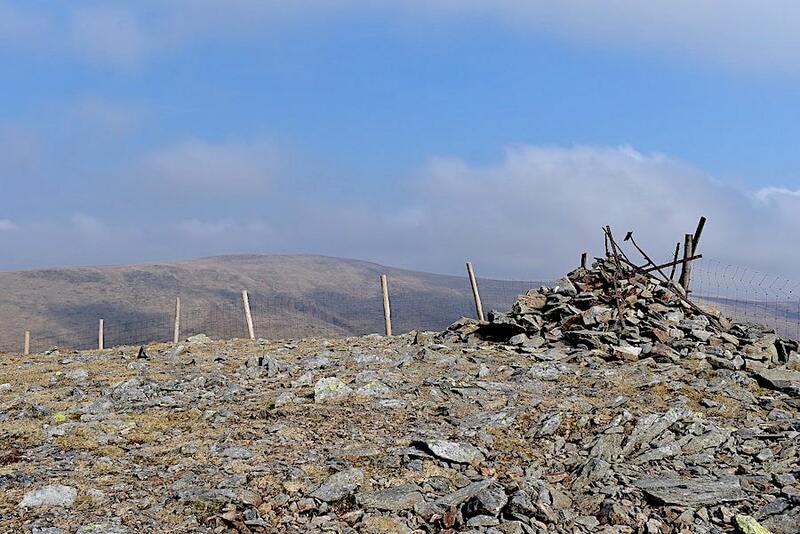 Having crossed the fence we turn up to the right and follow the ridge fence over to the summit cairn. 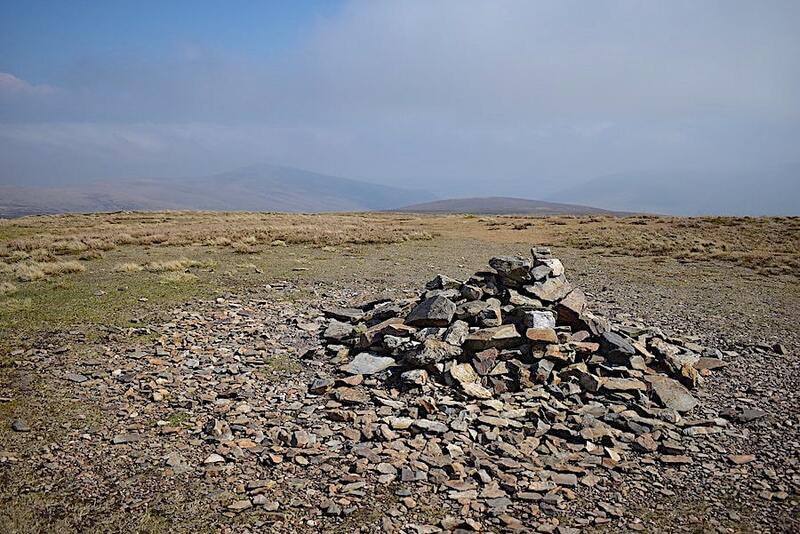 The higgledy-piggledy cairn on Great Calva with Knott, our next fell, on the skyline beyond. 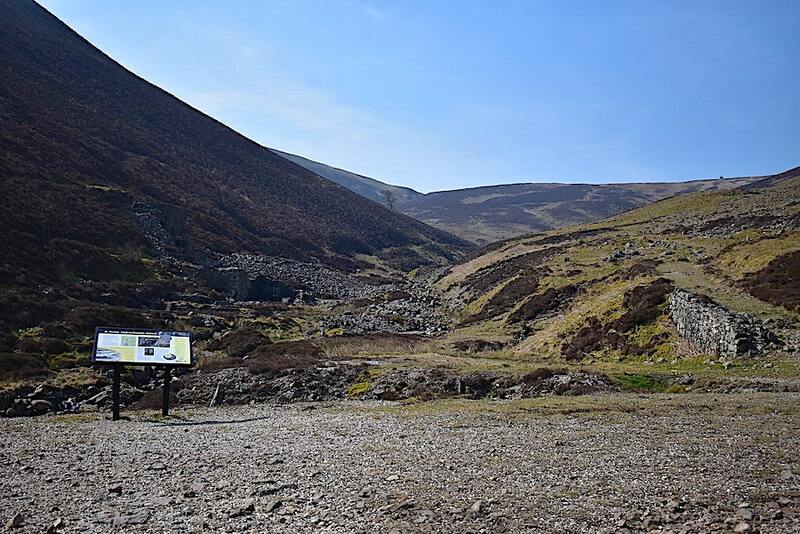 We’re glad that we had our coffee break beside Wiley Gill now because, although there is a good little shelter, over the fence and below the cairn just out of shot to the right, it wouldn’t have been of much use today as the wind would have been blowing straight into it. I walked the few yards over to the fence …..
….. for this view across to Knott, with Little Wiley Gill forming a deep cleft to the right of it. 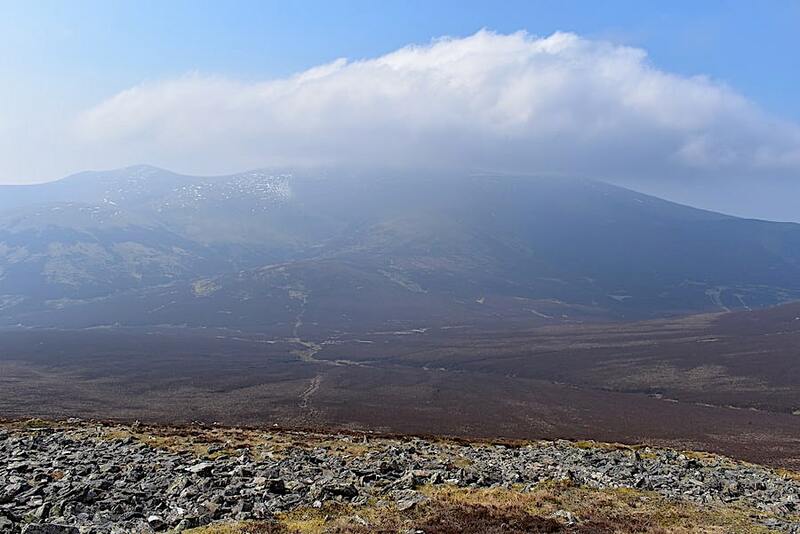 Although the distance between here and the summit cairn was only a few feet the difference in wind strength was noticeable and it was even fiercer here than it was at the cairn. Feet planted firmly and well apart and me and the camera using a fence post for stabilisation was the best way of avoiding being hurled o the ground. 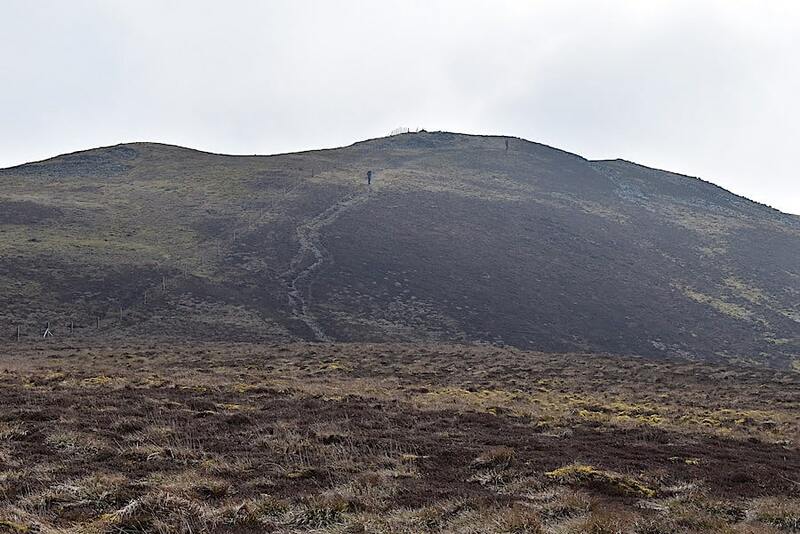 We didn’t linger as the wind was so strong and unpleasant to be in so we dropped off the summit and made our way down following the path leading over to Little Calva. Although it was still quite windy we lost height quite quickly and gained some welcome respite from much of the ferocity of it. 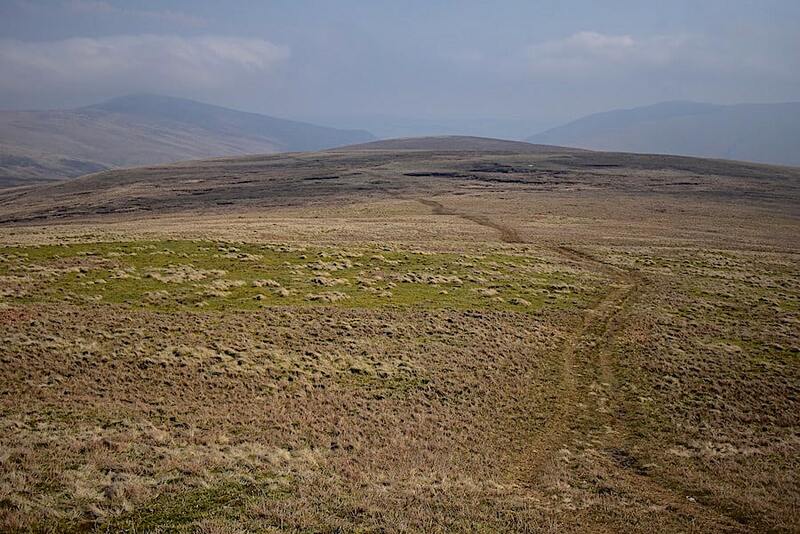 Having walked all the way from the car park to the summit of Great Calva without meeting a single person we now began to meet plenty of walkers coming across from Little Calva. 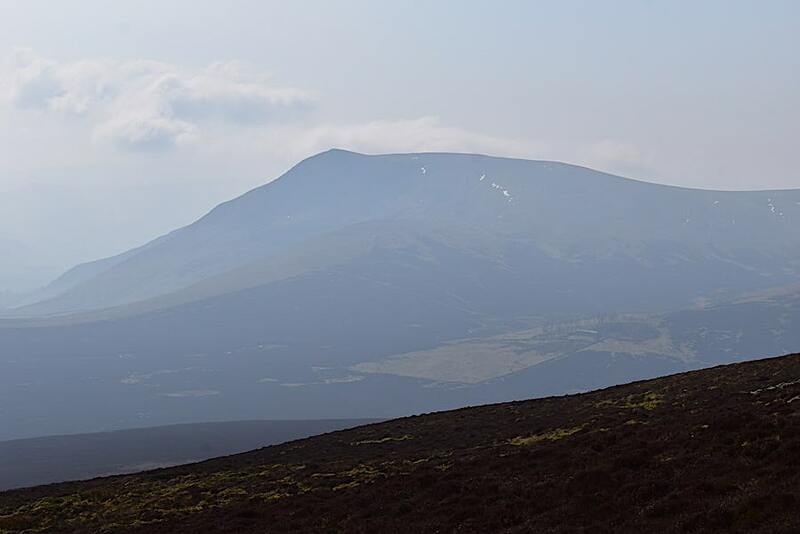 There’s the first one we met making his way up, a young lad with smart phone earpieces jammed firmly into his ears, as I take a look back to Great Calva’s summit. 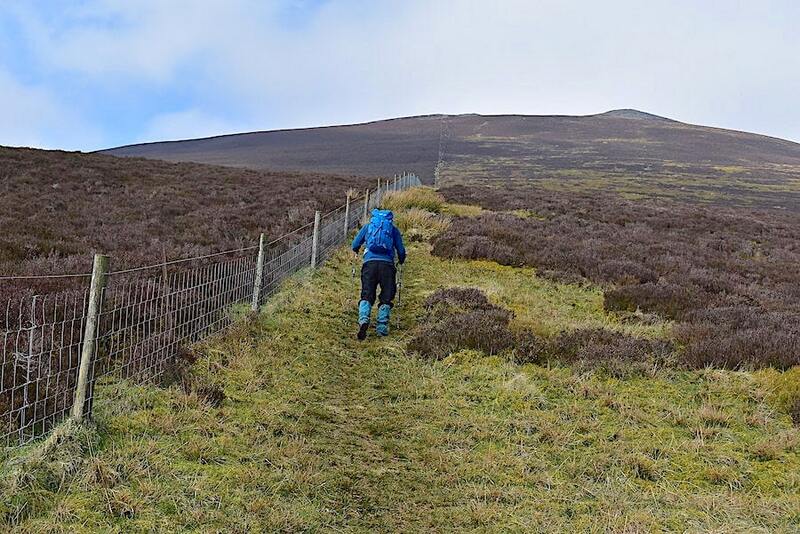 The fence makes a turn towards Little Calva and we cross the stile placed at the corner of it. J is auditioning for a place in a can-can line-up by the looks of it. Elegance personified! 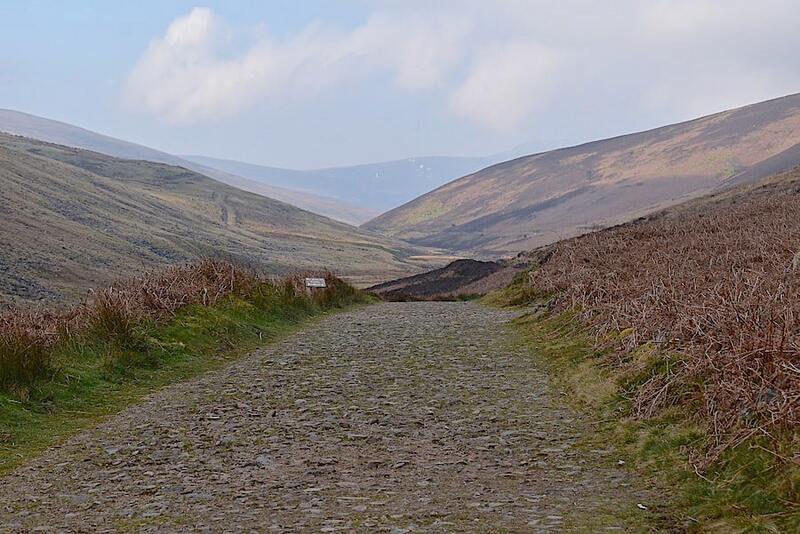 A path leads straight from the stile and takes us over towards Knott. On the way we have a view of Binsey (just about) on the left skyline, and across the middle foreground a couple of the Uldale Fells, possibly Great Sca Fell and Meal Fell. 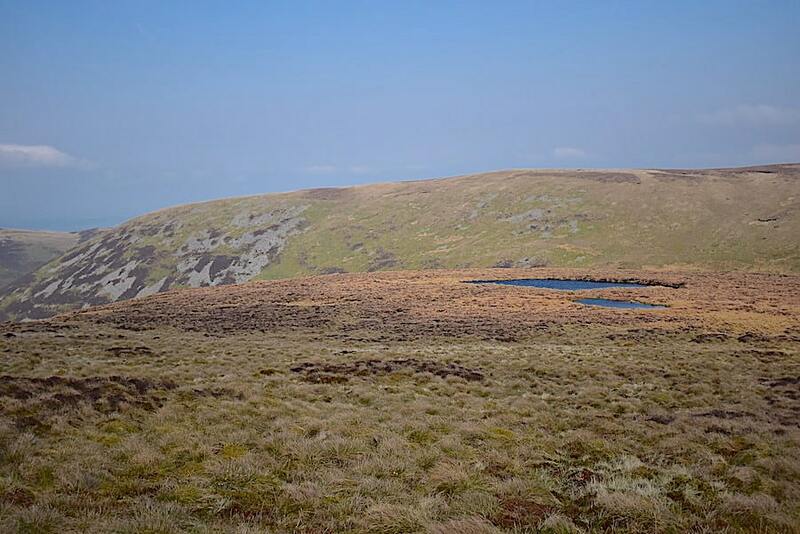 In front of the scree scarred slopes of Frozen Fell a couple of tarns add a bit of interest to the large swathes of largely featureless grassland. 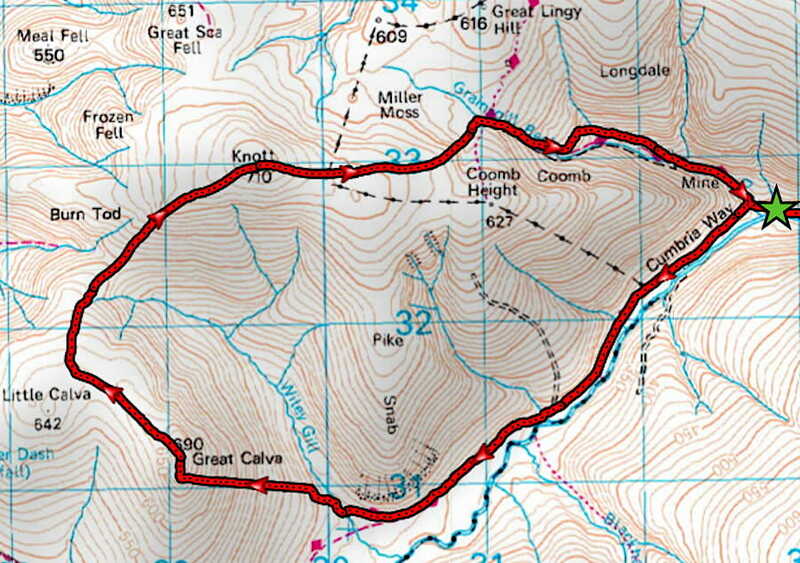 Now for the unwelcome part, for we’re at the point at which we lose our hard won height and have to drop down to the little col at the head of Wiley Gill, in the full knowledge that we’ll have to gain it all over again via the steep path up Knott. 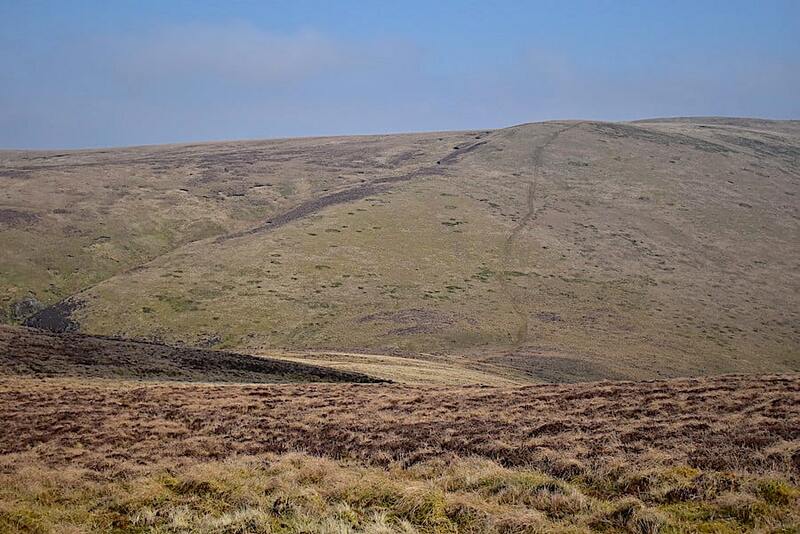 The path opposite is initially quite steep but the gradient eases off once you are over the top of the rise. 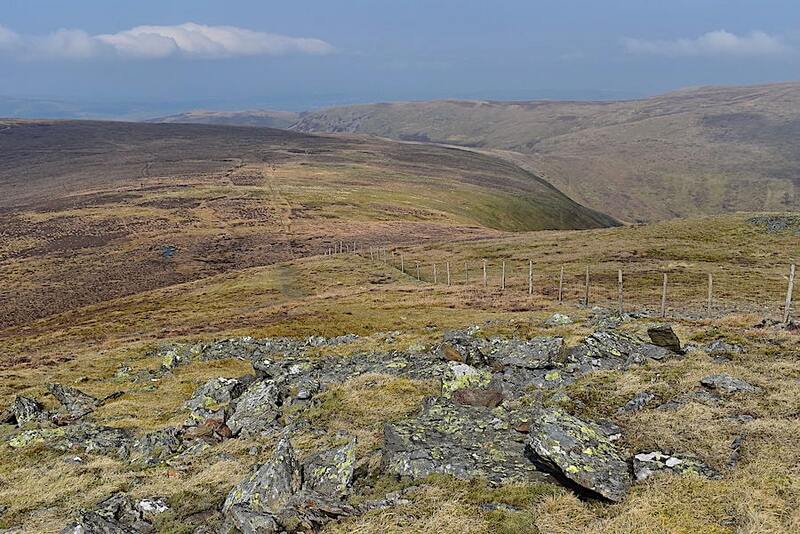 From the climb I take a look down Wiley Gill and across to Great Calva beyond which Mungrisedale Common and Blencathra are little more than smudgy silhouettes. 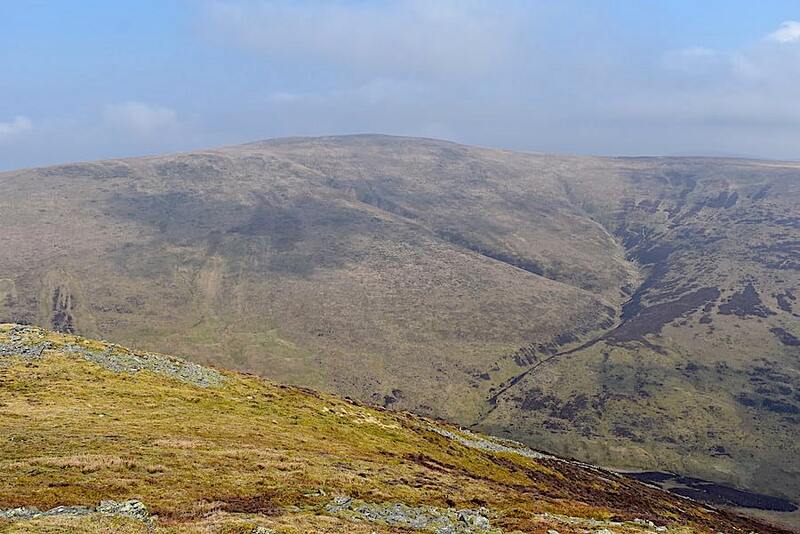 Looking back to Great Calva and the ridge we walked before dropping down to the col. Persuaded by J to have a go with the long zoom lens here’s a view of Bass Lake and, in case of difficulty identifying exactly where it is, its the lighter grey smidge across the centre of the shot. As I mentioned previously a close up view of clag and murk isn’t exactly spellbinding is it? 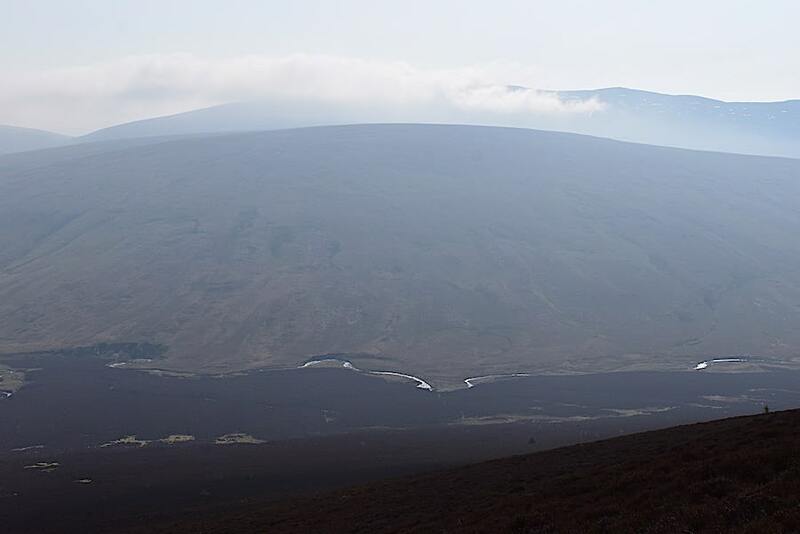 Well, at least we can see where we’ve been so the long zoom goes back in the bag and I revert to the standard lens to take this look back down the steep slope toward the couple of tarns and Little Calva. 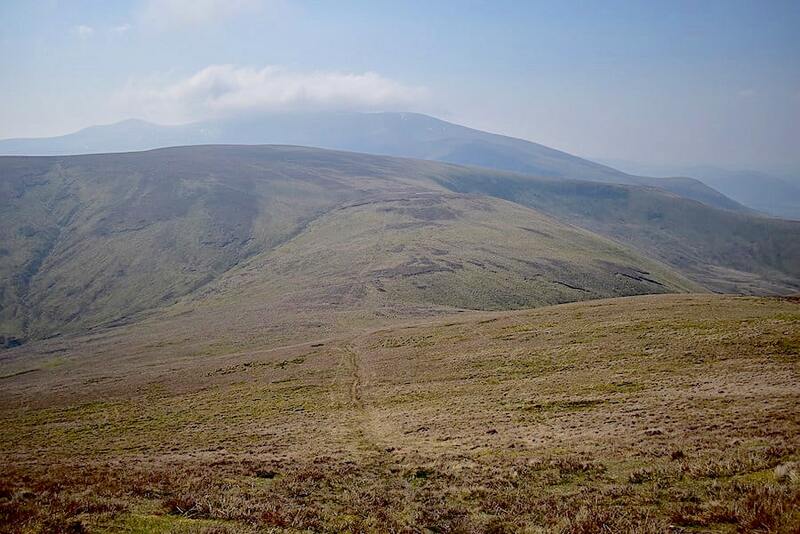 Skiddaw is still cloud covered so not a lot to be seen up there. Over the top of the rise and the gradient has eased although we couldn’t fully appreciate the gentler tramp since the strong wind was now blowing straight at us so it was much harder work than it would have otherwise been. 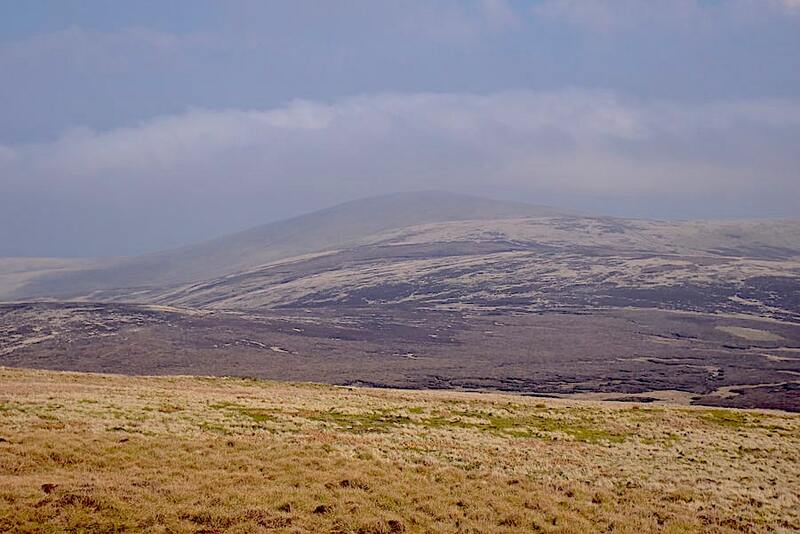 The summit cairn on Knott flanked in the hazy distance by Carrock Fell on the left and Bowscale Fell on the right. About a hundred yards back from this point we met the family of four, who we had seen heading up Grainsgill Beck from the parking area, leaving the summit and heading down the way we had just come up. We were both surprised that we hadn’t seen them long before now and wondered why it had taken them so long to get up to the summit. 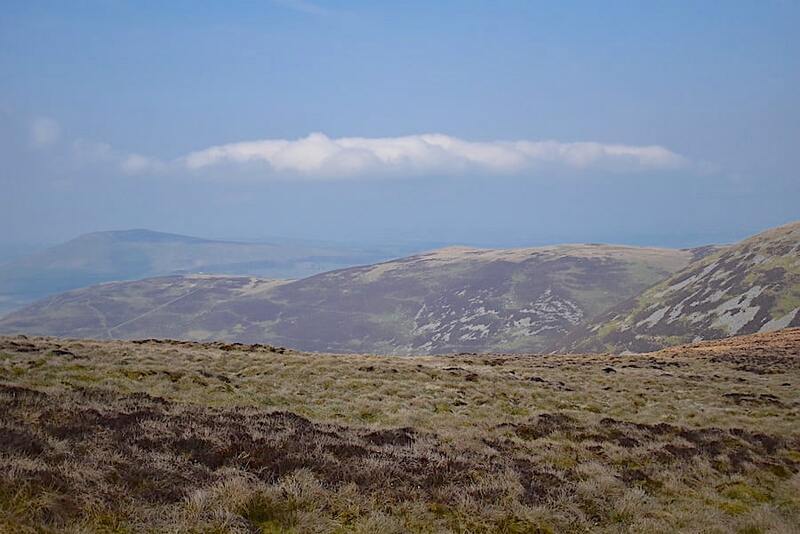 ….. and to the north west we could just make out the shape of High Pike. Views in other directions weren’t worth bothering with as everything was hidden in the haze. It was still very windy on Knott so we headed off eastwards in the direction of Coomb Height hoping to find somewhere to take a break and have something to eat. It didn’t look promising but in the dip beyond the peat hags we managed to find a small hollow to hunker down in and get the soup and sandwiches out. We’re in that crossover period when we wonder whether it will be a soup or cold drinks day so, although it was warm in the sun, the wind had a slight nip to it now so we were pleased we’d opted for soup. After our break we pick up the path again and begin making our way down. 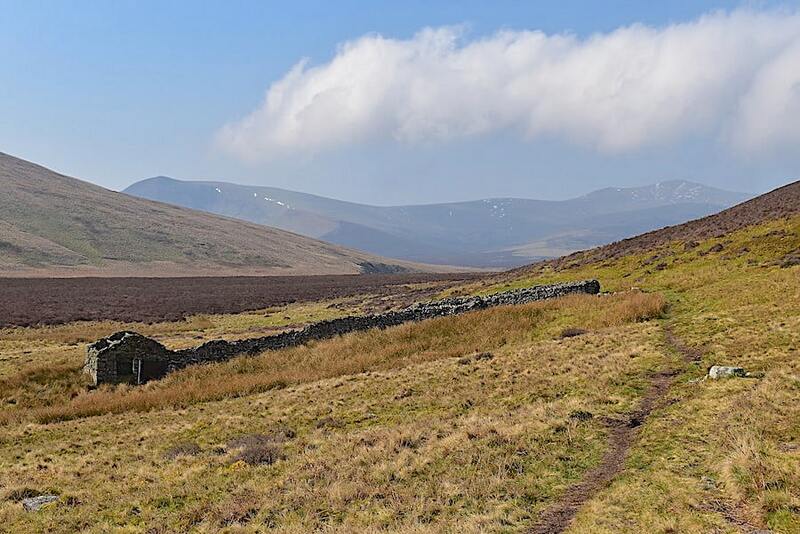 The wind wasn’t quite as strong along here so it was a pleasant tramp over the heathery moorland with a slightly less hazy view of High Pike over on our left. 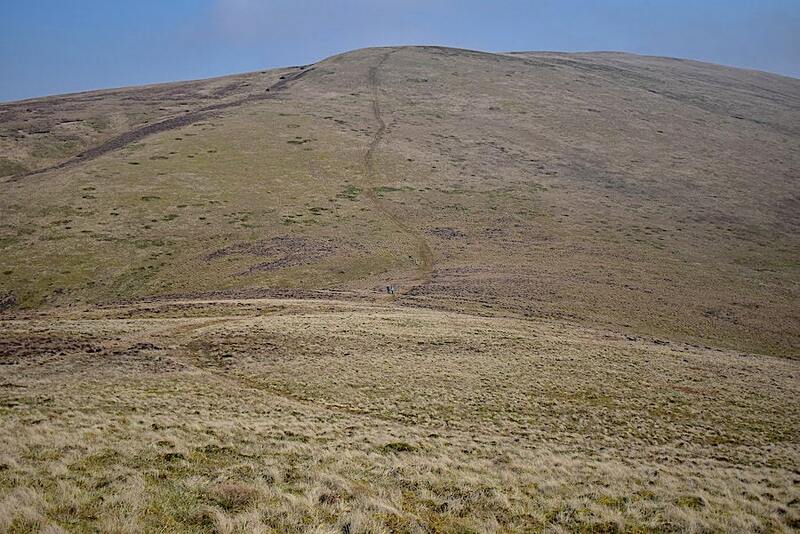 Ahead of us is Carrock Fell as we begin descending towards the sogginess of Miller Moss. 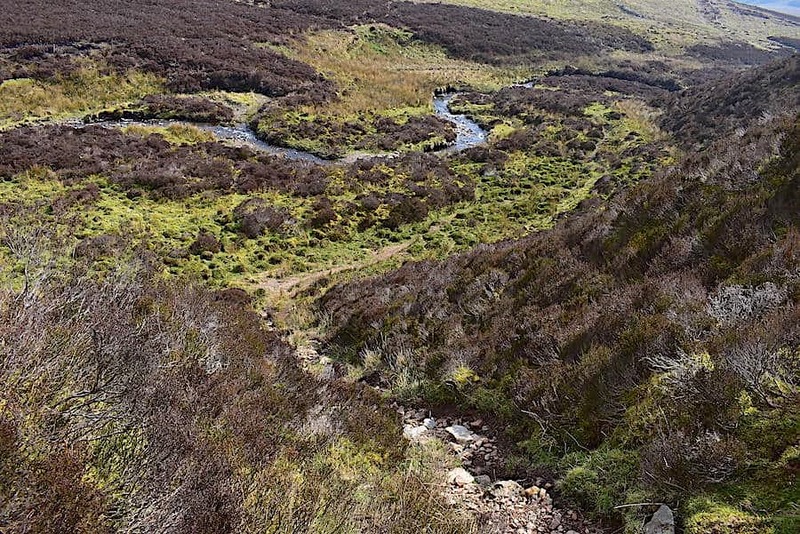 Once the wetness of Miller Moss was behind us we picked up the path alongside Grainsgill Beck and began the descent back down to the bridge. 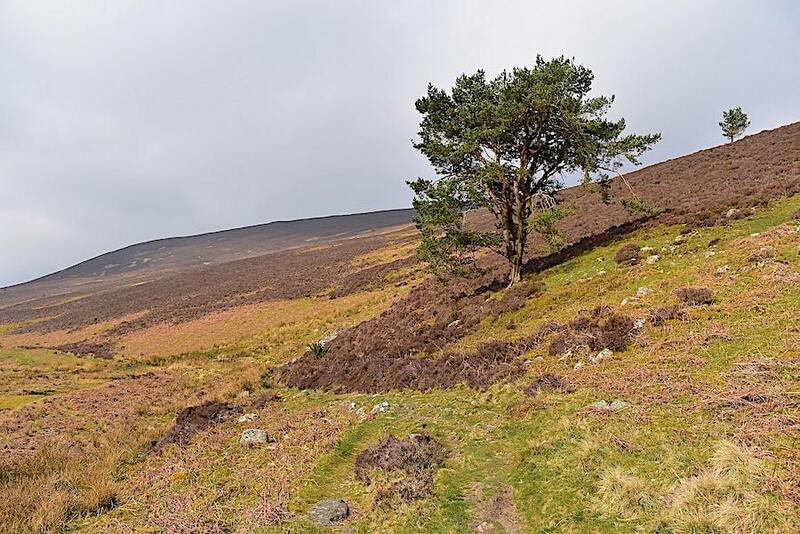 ….. and to our right are the heathery slopes of Coomb Height with Bowscale Fell right behind them. 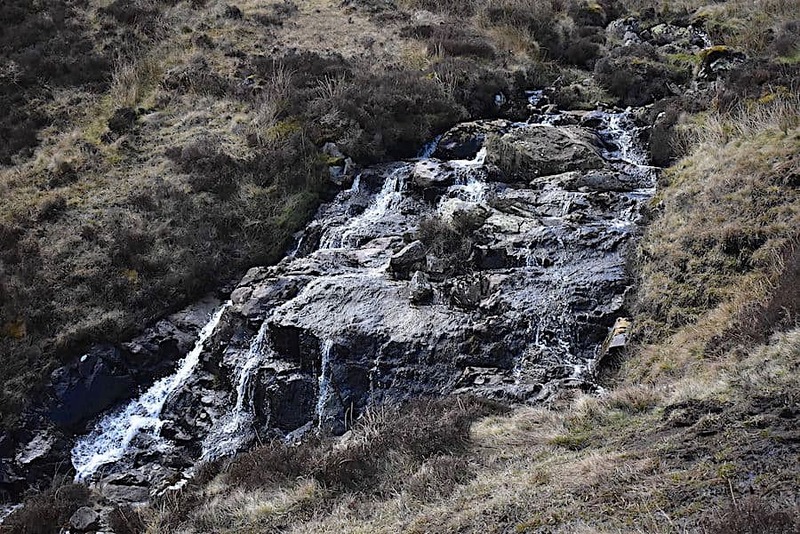 For the most part the path keeps fairly close to the gill from where some attractive falls can be viewed. Even though we haven’t had much rain lately and the falls weren’t quite as spectacular as they might have been they still make you stop and stare at them for a few minutes. Perhaps I’m just a fan of waterfalls though because I just can’t walk past them without stopping for a look. Our view down the valley as we continue the descent. As can be seen the path is quite clear and easy to follow. 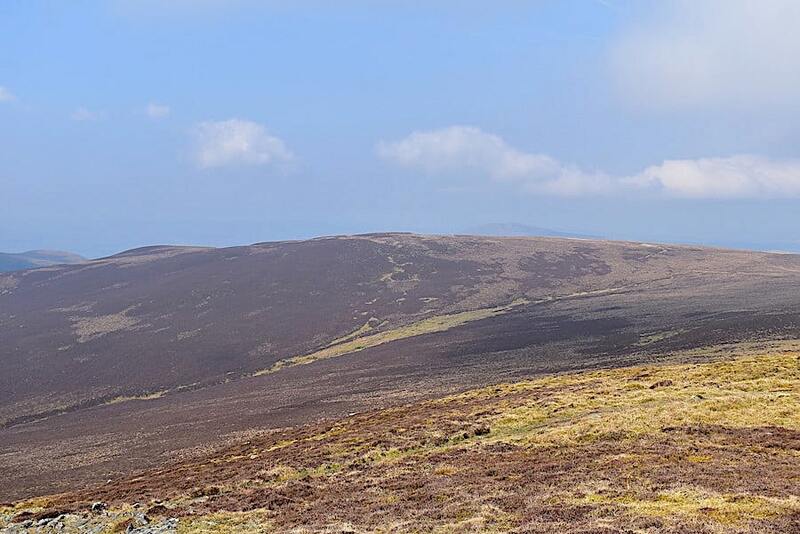 An old sheepfold towards the bottom of the shot and our view of Carrock Fell summit is gradually disappearing. 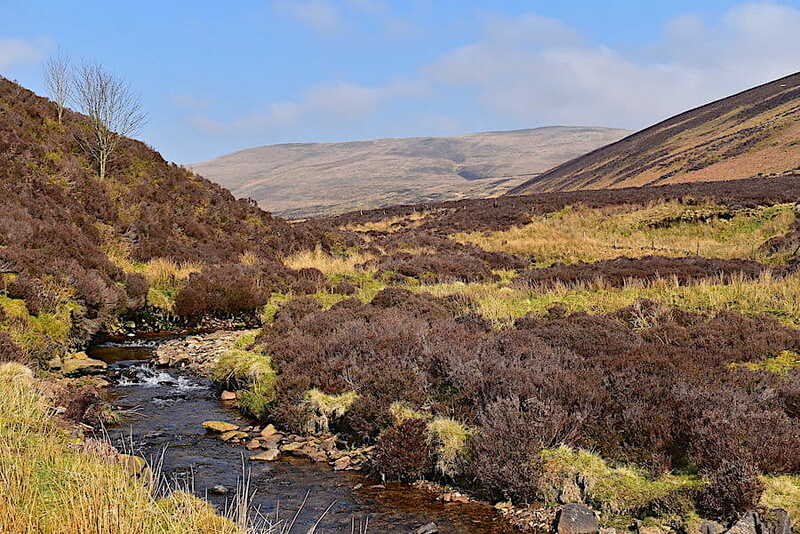 Approaching the little beck with the unusual name of Arm o’Grain which feeds into Grainsgill Beck. We’re a good long way down now and approaching the old mining area. 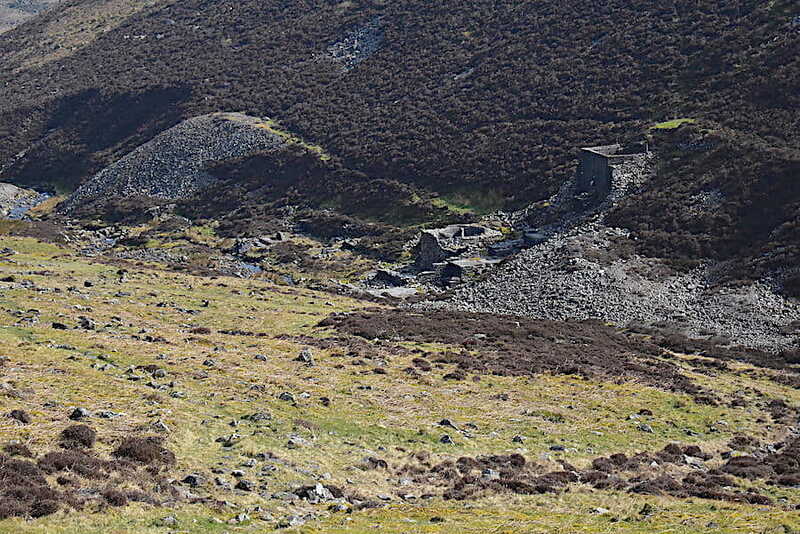 A closer look at the old mine building from a better vantage point a little further down. 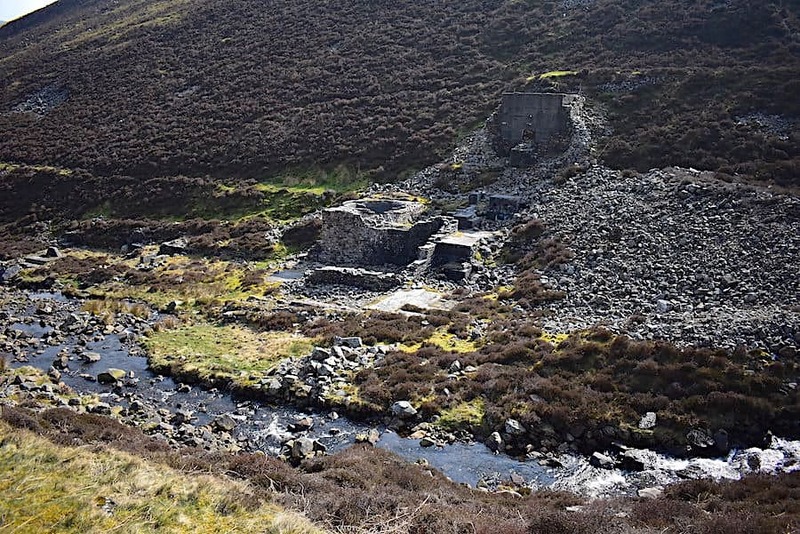 The mine was a source of tungsten and, if I remember correctly what I read on the info board, finally closed in 1981 and the buildings subsequently destroyed, presumably to prevent them falling into decay and becoming unstable and dangerous. The view back up Grainsgill from the information board at the mining area. On the skyline to the left you might be able to pick out the small square shape of the Lingy Hut, a cosy bothy with room for about four people to sit and take shelter, have lunch or put their feet up for ten minutes. J signed the visitor’s book a few years ago but I’ve no idea what he wrote. Well, that’s us almost back down to the bridge, which crosses the gill just below us, with Bowscale Fell rising up behind. All we have to do now is carry on down the path, bear right over the bridge and walk the last few yards to the parking area. When we got there the car belonging to the family of four was still waiting for their return and there was no sign of them coming towards us along the Cumbria Way. 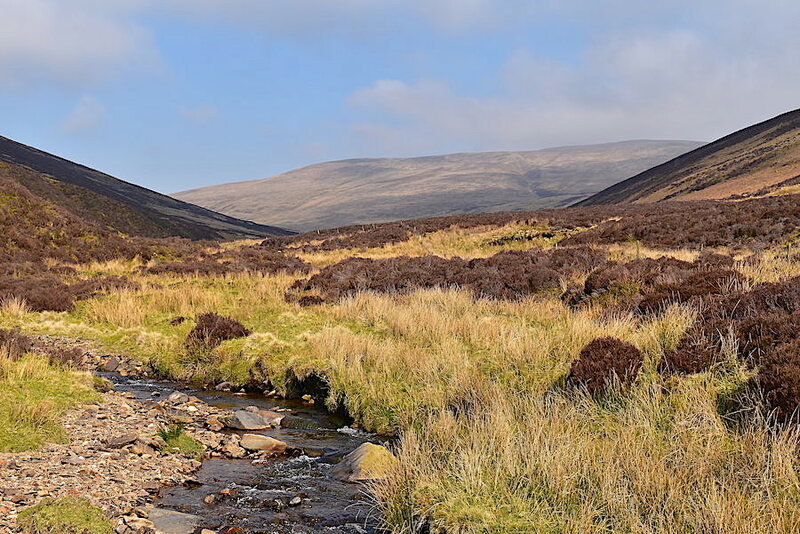 However, it is a walk of a little over two miles from Wiley Gill, if they dropped down to that point from Great Calva, so they would probably have been somewhere along there by now. I hope they’ve enjoyed their walk as much as we have and its been really good to be out on the fells again without the discomfort of clogged up airways.